Rocking with the rhythm! I didn't dare hope for a trim and gorgeous iPhone-like iPod so soon. I see there's no email button or notes on the iPod touch. There's no stock quotes or weather either. Lots of space for something but I don't know what. Now that OS X drives these little music machines, there's plenty of room for exciting possibilities. Who knows? Maybe Apple will open up the touch while guarding access to the iPhone for a while longer. Keep in mind that you don't get a speaker or a camera in the iPod touch. But then, not having to pay for a 2 year service contract with AT&T has got to count for something. You get more iPod for your money here. The 8 gig touch is $100 cheaper than the iPhone's new $399 price. Loving that Stevie Jay put wi-fi in the iPod touch (16 gig version is $399). Safari on an iPod. 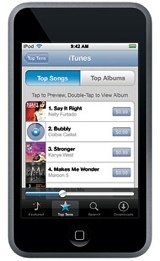 You can download direct to your iPod touch and iPhone from the iTunes store. Instant gratification. Direct downloads will play well in Asia where not everyone sees the need for a computer when they have a cell phone to take its place. Trying to figure out what I do next when I buy my next iPod. Do I blow my money and get a 16 gb iPod touch as a compliment to my iPhone? Probably not the smartest move. Seems too redundant and bulky to have two iPhone-sized devices. The touch is slightly smaller but not by much. How about a cute little 8 gig phatty nano ($199) as a sleek adjunct? All I have to do is divvy up the media storage in a logical way between the two. I'm liking that new green. I can't wait to see that 2" screen boasting an amazing 204 pixels per inch and delivering the same QVGA pixel count, 320x240, as its bigger brother. My theory on the iPhone price cut: (1) Steve needed to make that cut to drive more sales to meet the Sept 30 deadline for selling a million iPhones. They are on sale right now at the online store for $399 and (2) now there is room to charge $499 for the impending 16 gig iPhone and $599 for the 16 gig with 3G? The 4 gig iPhone is being phased out. Engadget says you can get them for $299 while they last. Also, if you just bought an iPhone in the last couple of weeks, you can ask for a refund of the difference less a 10% restocking fee. You go! Stock market dropped AAPL with perhaps a panic that (1) sales must not be brisk if a 33% price cut was needed and (2) hey, the margins just got shot to hell! And, one more thing. Free wi-fi at Starbucks for your touches and iPhones! A little wheeling and dealing there to get the free wi-fi with this button that will sell Starbucks tunes. Update: on further research, it is not clear that you can use the wi-fi for anything besides the iTunes store. That's weak if true. Overall, these are awesome new iPods. OK, the shuffle is a disappointment. But, the nano and iPod touch are both extremely cool and you can't beat the iPod classics for storage space. They share the new OS X UI. Critics were saying the iPod has peaked. Remember when Apple said 30 years and we are just getting started at the beginning of the year? They weren't kidding. With the drop of the iPhone price to a realistic level, who is going to stop Apple now? See Gizmodo's iPod touch photo gallery.